This weekend, I finished crocheting my latest blanket! I'm really excited because this blanket is pretty darn cool. It's not that I really needed another blanket - Lord, no - but I did want to use up some of my stash of worsted acrylic yarn, which was becoming a bit unmanageable. Back in February, I was looking around for ideas and remembered that I've had a design bookmarked (and saved to my Ravelry library) for years - the Ruby Hexagon Blanket from a blog called Novamade. I knew just what to do with my burgeoning yarn supply! Nova, the maker, calls her blanket "the coolest thing [she's] ever made," and I totally get why. The geometry of a hexagon blanket is really interesting, and in fact, was a bit too complex for me to grok all by myself when trying to figure out how big I wanted my blanket to be, and what that translated to in numbers - how many hexagons, how to arrange them, how to estimate the length and width when the motifs are not the same size vertically and horizontally (I'd only crocheted square motifs before). I wanted it big, but not huge - larger than a couch blanket, but not unwieldy-enormous. I turned to my husband, the best mathematical mind I know, for help with these complicated calculations (I also promised him that it would be long enough for him to use comfortably - he's surprisingly easy to persuade when there are math and coziness in the offing). He spent a few nights working it out for me, creating some useful schematics and diagrams - not to mention mathematical equations - to help me figure out what I need to do. If you want to have a look, he posted them recently on his own blog, Ink of Park. You may find his work useful too. I didn't have a specific home in mind for this blanket, but as I often do with works in progress, I periodically laid it out on my bed to see how it was shaping up. I started thinking that I really liked how it looked in my room, more and more as it grew. So in the end, I think it's going to be a bed blanket for now. I wasn't really into this look for my bedroom lately, but it feels right at the moment and I'm enjoying seeing it there. It's too warm to sleep with it now, and will be for about six more months, but that's okay. It looks nice during the day, on top of the coverlet. A few weeks ago, when I mentioned my blanket, I called it "folksy," which kind of stuck with me. I like that word; it reminds me of the librarian in my elementary school, who often used words like "folksy" and "cutesy" and "sweetsy," which I don't even think is a real word, but Mrs. Emsley was a character; she said whatever she liked. Anyway, I usually name my blankets and this one is Folksy. I'll be honest about something else - I haven't been feeling as enthusiastic about Maybelle, the huge blanket I'd recently made expressly for my bed, as I'd hoped I would. I'm not exactly sure why, but I think it mostly has to do with the struggles I had in planning it - I love the blanket, but it makes me feel stressy at the same time. It isn't a big deal, though. There are lots of places to use it. I like the idea of interchangeability in my blankets. I tend to be unnecessarily rigid in my crafting (it's my famous easy-breezy personality), but maybe that's not such a good idea - I'm working on giving myself permission to just enjoy a project, not letting it consume my feelings, using it however I like. It's just a blanket, lady. A hexagon blanket, by its very geometry, will have oddly-shaped sides. The hexagons are arranged in a honeycomb fashion, with short and long rows. This means that the sides will have sticking-out parts interspersed with recessed ones. I chose to crochet half-hexagons to fill in the recessed areas; I watched a couple of YouTube videos on half-hexagon techniques and blended the advice. I left the pointy hex ends alone - I like how they look. For my blanket's border, I just went with two rounds of granny clusters, trying to space them out at the joins between motifs, to prevent ruffling from excess stitches. The edges lie pretty flat, so I'm happy. I'm very happy with my joining method. I did this via the hodgepodge method too, after perusing hexagon join-as-you-go methods and coming away not totally satisfied. So I blended a few things, including the square-joining method I used when I made Big Gulp over the winter. I wrote up my technique for the hexagons recently here on my blog, if you're interested. I like the way this join looks and behaves; it lies quite flat and looks neat and tidy. Folksy looks pretty good with my warm-weather quilted coverlet set, the color of which is billed as "Steel Blue," but looks to me like a grayish-bluish-green, which may be due, in part, to my yellowish maple furniture. Whatever the color is called, it happens to be one of my favorites. There's a lot of similar color in Folksy, along with complementary ones. There are 68 hexagons in this blanket, arranged in nine alternating rows of eight and seven motifs (40 in the eight-motif rows, 28 in the seven-motif rows). Each hexagon is different. I like them all, but some more than others, of course. These are a few I particularly like. I was shying away from such jumbled variety before I made Folksy, but I'm kind of warming up to it again. 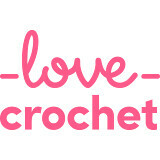 You just never know with crochet - it can surprise you. The best thing about this blanket - mathematical wonderment aside (and you know I'm really into that...yup), is how easily it came together. Once I realized I wanted to do this, it just fell into place. I didn't deliberate for very long, I didn't fret about colors or placement or anything else. I had lots of help, which I appreciate. It feels a bit like a group project because of that, which is nice. I have that same feeling I had when I made my first real crocheted blanket six or seven years ago - one of the best things in my day is the first time I walk by my bedroom door and see it on the bed. It's cool, like Nova said, and it's interesting. It taught me some things, used up lots of yarn, and makes me feel a little bit adventurous about crochet again. Yarn: I Love This Yarn worsted acrylic in the following colors - Cranberry, Burnt Pumpkin, Old Rose*, Rosy Cheeks, Lavender Smoke*, Sea Blue, Glacier, Arctic, Antique Teal, Stonewash, Dark Denim, Graybeard, Light Gray, Graphite, Coffee, Linen, Sungold, Dark Olive, Mid Green, Ivory (*discontinued); Vanna's Choice worsted acrylic in the following colors: Dusty Blue, Dusty Green, Dusty Purple and Rose. Your blanket looks amazing, Jennifer :) The colours are striking, but in no way garish or in-your-face and all work together. I'm currently making the same blanket, but in Stylecraft Special DK (for daughter #1 to take with her to university this autumn) and if it turns out half as nice-looking as yours, I'll be happy. 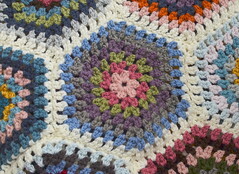 Beautiful blanket... no wonder it makes you happy! I love it! 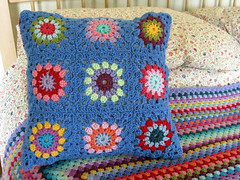 It looks perfect over your coverlet and is so cheerful. I like folksy things and I thing that name is just right! Love your blanket, thanks for details on how big it is. That is such a beautiful blanket, fresh yet cosy at the same time. Amazing indeed!Well done to you! Folksy is a winner, Jennifer. It looks fantastic, and matches really well with the coverlet. You seem to have done all that work in double quick time, so well done indeed. It's funny how some projects we take endless time and care and it turns out a bit 'meh', then another time just working with the stash or a vague idea, and we have a triumph! This is definitely one of those projects. wow that is incredible... it must feel so satisfying to see it lain out like that.. bravo! It’s perfect Jennifer! I always love reading your thoughts on your projects. You put so much of yourself into each work of art that you make and I think that is really wonderful. The colors are perfect for the blanket. And you’re right. It does seem folksy in a beautiful way. What a wonderful achievement, it looks wonderful in all its glory over your bed. Love the stunning colour combinations and the mathematical genius of your husband, great team work. It is pretty darn amazing and looks great on your bed. Kudos to your husband for helping with the mathematical layout. I made one hexagon once and had a difficult time with it. My brain doesn't do pattern well. It's fabulous. You've certainly got the gift as whatever you make always looks amazing. I've never made hexagons before, they haven't really grabbed my attention but I love how this blanket looks, I could be tempted. Gorgeous! The colors really work in your room. Love that you got your hubby involved. Mine is an accountant and often I'll ask him about how many I need to cast on, cause I can be math challenged. Out blog walking and saw you on a mutual blog friends blog, so thought I'd come visit. Always nice to meet new bloggers. This is amazing! It must have taken so long, but the end result is wonderful. Wow!